Creative-APPtitude - iPad Multimedia Tools for Creativity by Karen Bosch is licensed under a Creative Commons Attribution-NonCommercial-ShareAlike 3.0 Unported License. Welcome to Karen Bosch's Presentation Resource Page. My blogs are Elementary APPtitude and The Middle Pages. Please visit them for a view of my technology classes in action! Keynote Cartoon Selfie Video Tutorial - note, I made this very quickly for my students, it is not polished! Dremel Edu 3D Printers - Use my name for a discount (and our school receives filament to help with our projects). 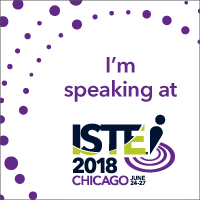 Learning with Apple Distinguished Educators: Enhancing Creativity, Productivity, and Content Creation - Cobo Center Atrium, Friday, March 22, 8:30 to 9:50 a.m.
People's Choice winner. Discover amazing and endless possibilities with Apple's Clips app! You’ll learn to make and share videos with text, graphics and effects while learning how to incorporate its use into your curriculum. Examples of teacher- and student-made Clips will inspire you to begin using this powerful learning tool. Yes, both you and your students can easily create eBooks on the iPad for any subject area and then publish them to the internet! In this session, we will explore how creating eBooks can both deepen and document learning. You’ll see examples of student created eBooks from a variety of grade levels. Then we’ll create an eBook that contains text, images, audio, drawing, and video. To participate in this session, please download the Book Creator Free app. In this hands-on session, we will explore iPad strategies that help learners of any age visualize their learning. We will look at student examples of drawing, sketchnotes, and infographics and then will give you a chance to try these creative strategies on your own. To participate in the activities, please download the Tayasui Sketches School and Pic Collage apps. We will also explore the drawing/annotation possibilities in the Apple Notes, Pages, and Keynote apps. Curious about getting started with 3D printing? This session will share from a beginner's perspective how 3D printing can impact learning in K-8 classrooms. We’ll share lessons, resources, apps and hints from our first two years using a 3D printer and offer projects that connect 3D design with problem solving and creative writing. Curious about getting started with 3D printing? This session will share from a beginner's perspective how 3D printing can impact learning in K-8 classrooms. We'll share lessons, resources, apps and hints from our first year using a 3D printer and offer projects that connect 3D design with creative writing. Thursday, March 8, 4:00 to 5:00 p.m. Grand Gallery F - I will be sharing drawing and sketchnoting with the Apple Pencil! In this hands-on session, we will explore iPad strategies that help students visualize their learning through illustrating, annotating, and narrating. We will look at student examples of sketchnotes, infographics, and narration and then will give you a chance to try the strategies on your own. Want to learn more? - I love working with educators to help them explore how to effectively use iPads and other technology tools to leverage learning and creativity in their classroom. My consulting sessions are filled with real and practical examples from the classroom. Click here for more information on working with me. How can we help our students to visualize their learning and “show what they know?” Illustrating, narrating, and animating are three powerful strategies that can be used with digital tools to deepen and document learning. Karen Bosch will share a variety of creative projects from her students demonstrating how these strategies can be used to make and publish learning artifacts. ADEchat Live – I will be one of the participants in the live Twitter Chat! Curious about 3D printing, but not sure why/how to get started? This session will share from a beginner's perspective how 3D printing can impact learning in K - 8 classrooms. Learn about real examples of motivating lessons from our classroom, including projects that connect 3D design with creative writing. Resources, apps, and hints from our first year using a 3D printer will be shared. Interested in using digital sketchnotes in with your students, but don’t know how to get started? 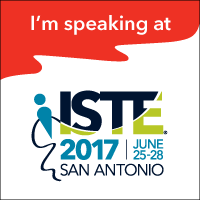 This session will share easy ideas and resources to begin using sketchnotes in your classroom. Participants will explore what a sketchnote is and why research identifies it as a powerful learning strategy to organize and document thinking, ideas, reading, and listening. They will learn about the basic components of a sketchnote and tools/apps needed/helpful to begin creating digital sketchnotes on an iPad with their students. They will discover resources, lessons, video tutorials, and examples from the presenter and her students (including a complete sketchnote course in iTunesU) on which will equip them to launch sketchnoting in their classroom. Bring your iPad and stylus and get ready to sketch! In this hands on session, we'll explore how iPad apps can turn poetry writing lessons into highly creative and engaging activities. We will create several multimedia iPad poems. Activities from this session could be used with students of any age and could be adapted for other kinds of writing/language arts activities. We also will learn how easy it is to publish student work using various methods including to iTunes. Student examples and a multitouch book with complete instructions will be shared. Look on the side bar for links to many of the iPad project examples that I shared, including the student eBooks. Looking for a previous presentation? - Please click on the left under "Where I've Presented" and "Presentations" for more information about my previous presentations.